Ah, Digital Podge - the yearly event when agencies come together to celebrate their work, the industry and enjoy their peers’ company over lunch. As the 2017 creative partner, we transformed Digital Podge into the ultimate “post-truth” experience, in what was “the best Podge ever”. An event for over 250 people from the top UK digital agencies gave us the chance to flex our creative muscles. Our video partner, Sandstorm helped us produce our own “Post Truth News”, described by The Drum as, "a terrifyingly dystopian vision of marketing's future". We were inspired by the success of our earlier work for SAXOPRINT, The Great British Postcard Competition, which redefined what being British meant post-Brexit. The post-truth treatment was our take on one of major themes of 2017 - the rise of fake news, political lies and the dislocation of reality and facts. In the industry, 2017 bombarded us with constant news of technological advances (name “the death of the marketer in favour of AI” for example) and the positive change in mindsets (customer-centric everything, anyone?). We wanted to encapsulate the same energy that TGBPC generated, by allowing our own industry to reflect on these changes and mock the premature assumptions and exaggerations around our “terrifying” digital future. 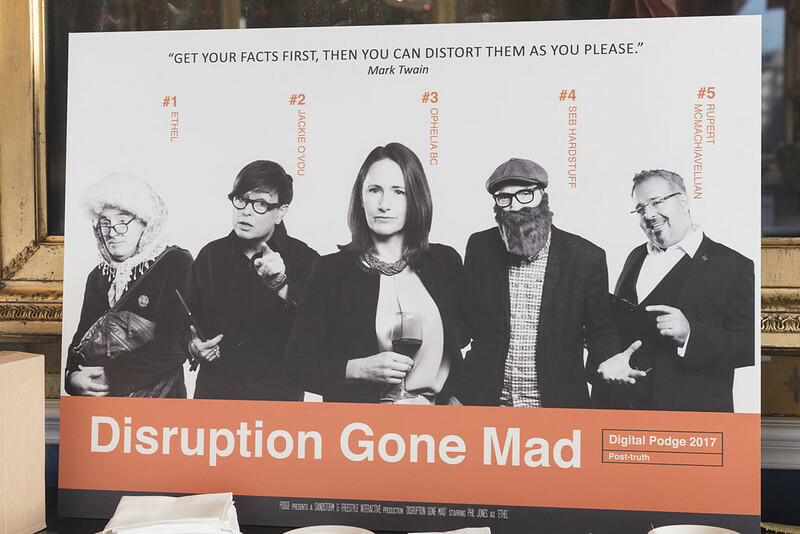 From designing the website to the wine bottle labels, from bespoke QR codes for the AI experience to a “fake news” report featuring Pierre Hansfree, digital transformation dinner parties, toilet signs and Tinder Content. We worked with Blippar, a company that provides business tools and solutions using world-leading augmented reality & visual search technologies. Guests snapped their individual, multicoloured codes through the Blippar app, and were able to play a game of “Fact or Fake” which targeted the attendees. Here’s a flavour of the game on The Drum’s website. The beginning of the year saw our client base expanding with five new wins, and we’re happy to announce that global heavy lifting and transportation specialist ALE is one of our new partners. This Episerver Partner was once again able to show that digital for B2Bs, manufacturers and “traditional” businesses does not have to be boring.